Cast members of the Windham Center Stage Theater children's production of The Wizard of Oz. WINDHAM – About 80 young actors and actresses are off to see the wizard for this year’s children’s show at the Windham Center Stage Theater. 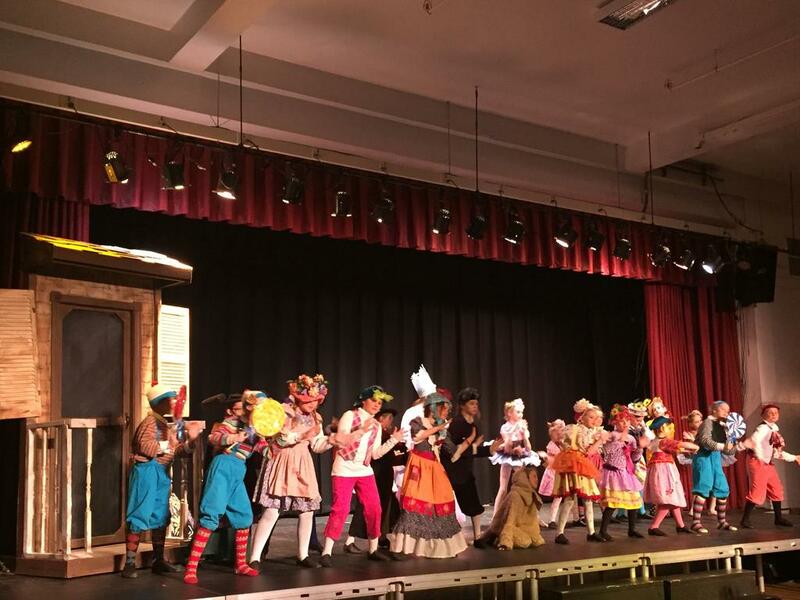 The annual kid’s production at the community theater is the classic, “The Wizard of Oz,” opening Friday, March 10, at the Town Hall auditorium. The cast is made up of students in second- to eighth grade, split into two groups that will alternate performances. The performers, who have been rehearsing since January, hail from the Lakes Region and beyond – and all seemed to be enjoying themselves during a dress rehearsal last week. “We thought this would be a show that would draw in a lot of kids this year, and it did,” said the director, Diane Hancock. Many of the cast members have appeared in previous shows at the Windham Center Stage Theater. This is the fifth production for 11-year-old Briella Krog of Windham, whose mother Heidi Doucette is the show’s producer. “It gives me time to act like a different person, and it’s just fun,” said Krog about the experience. She plays Professor Marvel. Chandler Johnston, 15, of Windham, has been in at least seven plays. He encouraged other young people to consider acting in productions at the theater. “Go for it. Just try and have fun,” said Johnston, who also has multiple roles this year as a monkey, a tree and an Ozian. For others, the production is an introduction to the world of theater. “It’s my first show and I thought it would be really fun,” said Morgan Yates, 7, of Windham. “My sister has been doing it for lots of years, and said that it’s really fun. “I’m an Ozian, a munchkin and a jitterbug … and it’s only my first play!” she continued. While most audience members will be familiar with the Wizard of Oz story, this production will bring a new take to an old stage saying. Olivia Elder, cast as one of the Dorothys, is redefining what it means to “break a leg.” The 14-year-old from Windham actually broke her right tibia and fibula a few weeks ago while playing outside, but she says the show must go on. Elder plans to perform on crutches, and says that her fellow cast members have gone the extra mile to help her, rehearsing lines with her from a chair and taking care not to step on her when on stage. Just as Elder credits her cast mates, Doucette, the producer, credits the many parents and other community members without kids in the play, like set painter Charlene Stewart, who make it all possible behind the scenes. “It’s a very big community effort,” said Darnell Stuart of Casco, who is one of the costume designers and is in her 10th year with the theater. Her first production with the Windham Center Stage Theatre a decade ago was also “The Wizard of Oz. Tickets cost $10 for adults, and $8 for children and seniors. “Tickets sell fast,” warned Hancock. “The Wizard of Oz” will be performed on Fridays and Saturdays through March 26 at Windham Center Stage Theater at Windham Town Hall. Cast members of the Windham Center Stage Theater children’s production of The Wizard of Oz. Olivia Elder, 14, of Windham, will be playing Dorothy on crutches after breaking her leg several weeks ago.